Elizabeth Denton Baird, member of the Salem College class of 1983, was selected to be the guest speaker at Founders Day Convocation. Celebrated each April at Salem Academy and College, Founders Day honors Elisabeth Oesterlein, the first teacher of the 242-year old institution. 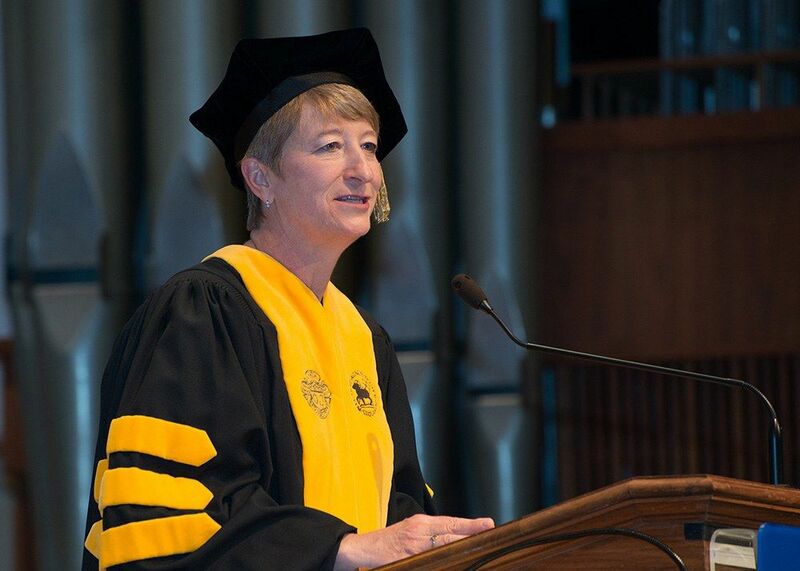 A distinguished guest is invited to address the entire campus community, including students, faculty, staff, and alumnae. Liz Baird is the Director of Onsite, Offsite and Online Education at the North Carolina Museum of Natural Sciences in Raleigh. She directs student programs and special events and conducts research. Her collaboration with her colleagues on deepwater corals research recently won a “Partners in Conservation” award from the US Department of the Interior. In addition to daily job responsibilities, conducting research, and leading an annual teacher workshop to Belize, Baird founded International Take a Child Outside week, which is held September 24-30 every year. This event engages partnering organizations in all 50 states and in four foreign countries. Working with a group to write and receive a nearly $8 million National Science Foundation grant, Baird has a special interest in creating citizen science projects that students can conduct in the classroom. She currently serves as the Chair of the Board of Visitors at Salem and has previously served on the Salem College Alumnae Board. Baird returned to speak to Salem, where she has deep roots, as her grandmother, mother, aunt, and daughter are all graduates. Similarly, she said all Salem students are part of those deep roots, like the trees in the May Dell that are connected to biological and historical events long past. Baird commented on the Bald Cypress that has stood by the May Dell for between 130 and 190 years. The seeds to grow such a sturdy tree were likely carried to the place it now stands by the Carolina Parakeet, a species that has been extinct since 1918. Musing over the tree’s origins, Baird noted that it may have been planted intentionally, or, it may be a link to the lost species. In the way that nature provides links to the past, so too does Salem continue to link its current community to those who came before. In her address, Baird commented on the comradeship and “sisterhood” of Salem graduates, saying, “We refer to the sisterhood of Salem, which includes not only our classmates, and the classes that surround our experiences here, but also everyone who has a Salem connection.” She also placed special emphasis on the quality liberal arts education that Salem students receive. “A liberal arts education, such as Salem has been providing for 242 years, provides the building blocks of knowledge and the catalyst for you to go on and be successful in any setting,” Baird advised, before noting that her grandmother studied music at Salem College, but ultimately became the director of the Red Cross in Rocky Mount, N.C.
Baird’s Founders Day address reminded students that their future as Salem women is bright and that their experiences here are meaningful, preparing them to thrive outside of their familiar, close-knit community.